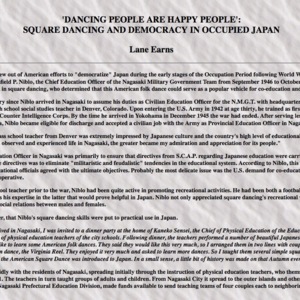 The linked article, by Lane Earns, describes the key role played by Winfield Niblo in bringing American square dance to Japan in the years immediately following World War II. The article also highlights the enthusiastic participation in square dancing by Prince Mikasa (the younger brother of Japan's emperor) and his wife, Princess Yoriko. Niblo died in 2007. Here is a link to his obituary which contains more information about his life. We have also included information about square dancing in Japan from a 1992 interview with caller Rickey Holden. HON. JAP BOYS DO HON. S. D.
Sent to us by "Jonesy" is a clipping from the March 15th issue Nippon (Japan) Times, with the caption, "Emperor's Brothers Enjoy Square Dancing in Hokkaido." The article starts out: From the atom-bombed hills of Nagasaki to the lonely snow-covered peaks of Hokkaido, a new cry is ringing out over Japan. It's 'Alaman right' and 'Alaman left' and `Swing your partners' to the tunes of `Oh, Susannah' and little Brown Jug' as Nippon takes to the square dance." The article tells how one Winfield Niblo of Denver, Colorado, brought square dancing to the Hokkaidoans and how they are in turn dipping and whirling as earnestly as the rest of the world. The Royal Family, including the Princes, happened to "pop in" at the Municipal High School gymnasium in Hokkaido just as the six-piece City Hall Band "hammered" out "Nellie Gray" and "Golden Slippers," and 1,000 Sapporoans pushed and tugged each other around the cold hall. The Princes liked the idea and got in the swing of the thing themselves. Writing in 2012, caller Tony Parkes commented, "Prince Mikasa is still alive at 96, though I doubt if he's dancing much. In his prime at least, he was an avid folk and square dancer (both traditional and MWSD, apparently). I did the Virginia Reel with him at the New York World's Fair in 1964 or 1965. "In 1956 the U.S. State Department sponsored a tour of Japan by several American folk dance teachers, including Ralph Page. Reportedly JVC (Japan Victor Co.) issued several recordings of Ralph's dances; those must be real collector's items now. I don't know whether Ralph recorded them in Japan or they were straight reissues of the sides Ralph had made for Michael Herman around 1950." Masaharu Hiraga, a Japanese dance caller, writes, "He passed away on March 8, 2007, and we leaders of Japanese folk dancers got together on October 8 of the same year to hold a "Thank You Niblo-san Party" in Tokyo with Prince Mikasa, Mrs. Niblo and their daughter Bernadette Niblo attended. We danced an Old Time Singing Square Dance "Up Town and Down Town" choreographed to the tune of Golden Slippers." Here are two photographs of Niblo. 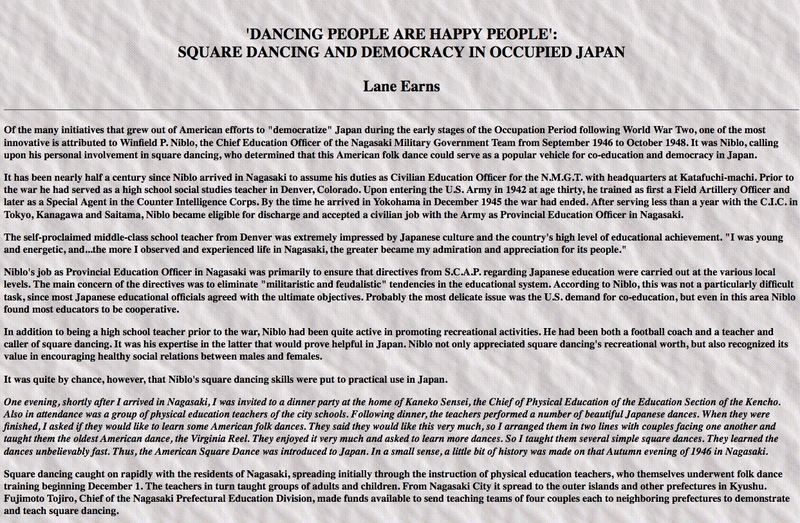 “Square Dance in Japan,” Square Dance History Project, accessed April 24, 2019, http://squaredancehistory.org/items/show/219.